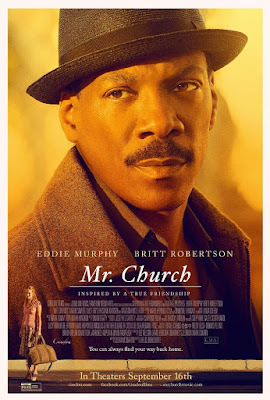 While Mr. Church might have initially been looked at as something of a return to quality movie-making for star Eddie Murphy it is more a return to the realm of inoffensive movie making than anything else. Mr. Church is certainly no Pluto Nash or Norbit...hell, it's not even Meet Dave (which I admittedly never finished), but it isn't the high-reaching piece of transcendent cinema that encapsulates all the major themes of one's life that illustrates mistakes made and identities redeemed that it seemed to want so badly to be in its trailers either. Rather, Mr. Church is a pleasant enough distraction about a kind-hearted man that is largely elevated by the credible performances of its two leads. Both Murphy and Britt Robertson (Tomorrowland) deliver the necessary sympathies to draw on audience emotions that keep us invested in the sometimes tedious story that strings us along for decades with large stretches where little to nothing happens or is revealed. Fortunately, it isn't really the narrative that is meant to drive Mr. Church though, but rather the core relationship that forms between Murphy's titular character and Robertson's Charlotte Brody which remains the reason we become and stay as invested as we do throughout the sometimes tepid 100-minute runtime. The film, which comes from TV writing veteran Susan McMartin in her first feature film credit, feels rather episodic as a result with director Bruce Beresford (Driving Miss Daisy, Double Jeopardy) doing little to add any filmmaking flairs as, at the age of seventy-six, seems to be on auto pilot. In that way, Mr. Church is very much a competently made and sometimes even emotionally affecting film, but most of the time it feels like a Hallmark movie that is emotionally manipulative for reasons of knowing it has little else to offer by way of connecting with its audience. It is a holiday Hallmark film that escaped the clutches of such a fate by appealing to talent such as Mr. Murphy by being a project not typically offered to the comedian and thus an opportunity after an intentional hiatus to do something different. Murphy, while doing his best to salvage this sappy if not occasionally comforting piece of melodrama can't rescue the project from total mediocrity, but he puts forth a valiant effort and that is duly noted. Mr. Church (Eddie Murphy) is a proficient cook who finds himself in the employment of two unique ladies. Set in Los Angeles and beginning in 1965 we are introduced to Henry Church (Murphy) as he finds himself in the employment of a cancer-stricken mother named Marie (Natascha McElhone) and her daughter, Charlotte, to serve as their cook after the passing of his previous employer and Marie's seeming sugar daddy. Though Charlotte, who comes to be affectionately called "Charlie" by Mr. Church, doesn't like the idea of a third wheel entering into her and her mother's cozy little existence that all changes when she tastes the food Mr. Church will be preparing for her every day. The smells of cooking would become like her alarm clock Charlie says and just as Mr. Church decimates those walls between him and his toughest critic he also begins to find himself in the position of a father figure to young Charlie. Not knowing that her mother has only been given six months to live and that Mr. Church has been tasked with a six-month arrangement by that previous employer that will guarantee him a lifetime salary should he fulfill it, Charlie is never given the chance to get mad she was left in the dark as that initial six months ends up being extended longer than all involved originally anticipated. Soon, Charlie has grown into a young woman who resembles Britt Robertson and who has taken to the collection of books Mr. Church takes with him everywhere he goes. Becoming a fan of literary endeavors Charlie seems to dream of writing herself one day, prompting her to apply for college and leave behind Los Angeles for Boston, but not before sharing a special prom night with high school crush Owen (Xavier Samuel) that means as much to Charlie as it does to her mother and Mr. Church. As life goes, the small world Charlie knew in L.A. and the core group of people that make up her life (which also included her best friend Poppy as played by Lizzy Fry and a homeless guy named Eddie Larson who is played by Christian Madsen) come back around to define what will make up a large chunk of her story when she returns to her hometown and allows her degree to slip further and further away. In the end though, Mr. Church is about this unlikely pair that see many ups and downs throughout their relationship, but who naturally end up learning from and teaching one other a number of life lessons. Mr. Church is the type of flick that hangs its hat on to the core mystery of who this titular man is. Coming off as this all-knowing persona who has vague quirks such as only cooking with his hands, a fork and a knife with no fancy tools or measuring cups that could suggest any number of things about his origins and beliefs, but which never really come into play. Rather than letting such material breathe the film lathers on the narration via Robertson as the story is told from the perspective of Charlie which only enhances this mysterious quality all the more. The good news is that while McMartin gives her first feature a rather episodic structure she is able to pace the deconstruction of her main character in nice succession where we as a viewer are given glimpses of who Mr. Church might really be or what his motivations are by the half hour mark; after that core relationship is firmly established. Followed by more layers being pulled back in fifteen minute increments from that point on we never feel as if the film is purposefully holding out on us. It is when Mr. Church hits the hour mark where it could have taken a potentially traumatic turn that, while indeed being highly dramatic and devastating, would have ultimately made the remainder of the narrative clearer and ultimately easier for our main characters to carry on in an expected fashion. Rather, McMartin makes the braver choice-leaving Mr. Church and Charlie to brave the uncertain waters of their more complicated futures that the film then immediately undoes by fast-forwarding five years into the future where our characters have once again found routine with only a short montage (with more narration) to illustrate the more testing times our two leads go through together. It is this need to consistently feel comfortable and warm that undoes any of the real tension Mr. Church might have otherwise held. It is this need to constantly remind us of how much Mr. Church sacrificed to take care of Charlie and her own ultimate offspring, Izzy (Mckenna Grace), instead of showing us the struggles and strains this man had to go through to do so that make Mr. Church that Hallmark movie that finds solace in skipping over the more difficult times in life while still hoping to make a poignant point. Were we not given reason to think things turn out as well as any other option Charlie saw for herself we might actually buy into such schmaltz. 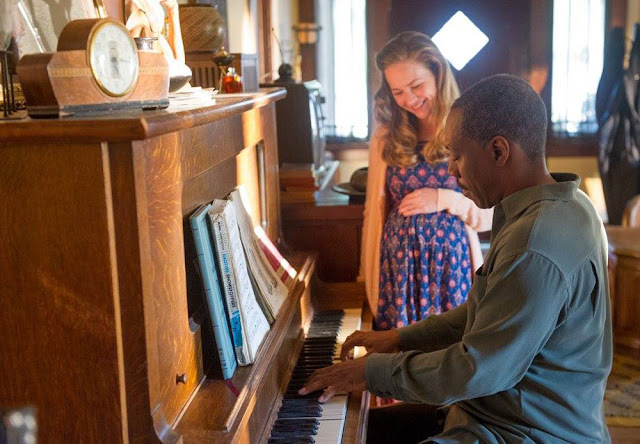 Charlie (Britt Robertson) turns back to Mr. Church longer after his promise to look after her has expired. 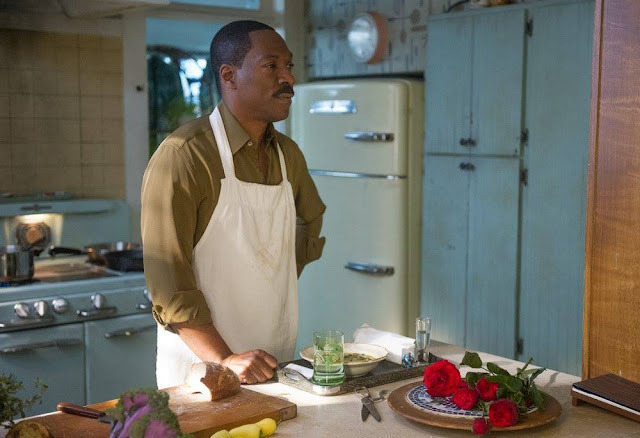 As this mysterious caregiver Murphy's Mr. Church is a graceful, soulful man that finds solace not only in preparing food, but in preparing that food to jazz. Murphy infuses these traits with real credence by remaining largely stoic outside of the times the movie allows such smooth melodies to creep into its score. Mr. Church is a man who likes to garden, who obviously cares a great deal about reading and expanding his pool of knowledge, while also playing the piano, painting, and well, as the list grows longer it becomes apparent that Mr. Church is a man of many hats-many hats we don't have to necessarily see play out, but that the film keeps us aware of and that Murphy perfectly relays by allowing these hobbies and talents to feed off of one another; mixing to provide new life and fresh takes on what could easily be stale tropes. We accept Murphy fully as this character and in the most telling part of the performance we come to rely on his character much like Charlie does to carry this picture through to the end where we root for him to find as much solace as his movie does in orange-tinted exterior shots. Much of the same could be said for Robertson as her efforts here do not go unnoticed. Charlie is a tough character to crack as she is simultaneously a brat with the caveat of the audience understanding the many influences that have given way to such an attitude. Still, while we may cringe at the punk-like preferences of Charlie in her early years the influence of Mr. Church is clear by the time Robertson takes over the role. Though the narrative drive never finds the gas pedal well enough to really punch down and get going, especially in regards to the Charlie character, Robertson is able to bring a real sense of perspective to the character especially in the latter half of the film when McMartin uses her television series writing skills to deliver some nice symmetry to many of the supporting characters. It is in the way Charlie frames these people that have been an integral part of her life that allow us to see the progression of the character more than the actual accomplishments (or lack thereof) that she has achieved in her own life. And while the film can't help but to over explain what we'd already taken away from the relationship that develops between Mr. Church and Charlie it's not hard to forgive a movie where the main characters catch phrase is "pleasant enough," and the movie itself could be described in very much the same way.